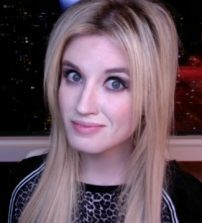 Grace Randolph is the host & creator of Beyond The Trailer where she is one of the top movie reviewers on YouTube, and the top female reviewer. Grace also has the #1 trailer reactions, box office report and coverage of breaking entertainment news on YouTube. She is honored to be a member of the BFCA, and is also a certified critic on Rotten Tomatoes. Overall Grace has over half a billion views on YouTube and over 800K subscribers. Grace has also written several comic books for DC and Marvel, plus her creator-owned series "Grace Randolph's Supurbia" which ran for 16 issues for BOOM Studios. She studied film at NYU's Tisch School of the Arts. Grace also had her own sketch and improv comedy group that performed in Times Square and NYC's famed The Comedy Cellar.